th'apostles saw their risen Lord. that Christ was risen from the grave. the willing tribute of our praise. thine own redeemed forever shield. Display Title: That Easter Day with Joy Was Bright First Line: That Easter Day with joy was bright Tune Title: PUER NOBIS Author: John Mason Neale, 1818-1866 Meter: LM Date: 1994 Subject: Easter | Source: Latin hymn, 4th or 5th c.
Display Title: That Easter Day with Joy Was Bright First Line: That Easter day with joy was bright Tune Title: LASST UNS ERFREUEN Author: John Mason Neale, 1818-1866 Meter: LM with Alleluias Scripture: Luke 24:13-35; John 20 Date: 1994 Subject: Easter Season | Source: Latin, 5th C.
Display Title: That Easter Day with Joy Was Bright First Line: That Easter day with joy was bright Tune Title: PUER NOBIS Author: John Mason Neale Meter: LM Date: 2010 Subject: God the Son | Eastertide; Christian Year-Eastertide | Source: Latin hymn, 5th cent. 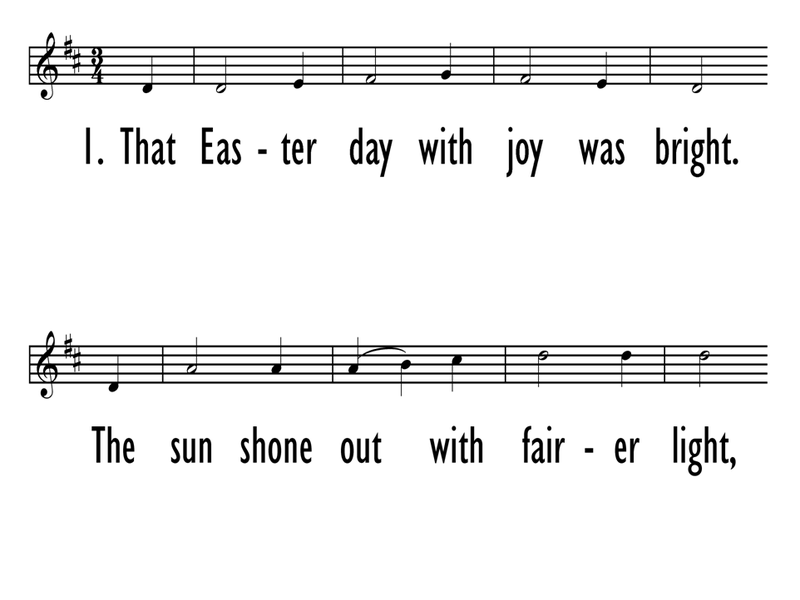 Display Title: That Easter Day with Joy Was Bright First Line: That Easter day with joy was bright Tune Title: PUER NOBIS Author: John Mason Neale, 1818-1866 Meter: L M Date: 2006 Subject: Easter | Source: Latin hymn, 5th cent. Display Title: That Easter Day with Joy Was Bright First Line: That Easter day with joy was bright Tune Title: PUER NOBIS Author: John M. Neale, 1818-1866 Meter: LM Scripture: John 20 Date: 2011 Subject: Easter Season | ; Jesus Christ | ; Joy | ; Light | ; Paschal Mystery | ; Petition/Prayer | ; Praise | ; Presence of God | Source: Latin, 5th C.
Display Title: That Easter Day with Joy Was Bright First Line: That Easter day with joy was bright Tune Title: PUER NOBIS Author: John M. Neale, 1818-1866 Meter: LM Scripture: John 20 Date: 1994 Source: Latin 5th C.
Display Title: That Easter Day with Joy Was Bright First Line: That Easter day with joy was bright Tune Title: PUER NOBIS Author: John M. Neale, 1818-1866 Meter: LM Date: 2004 Source: Latin, 5th C.
Display Title: That Easter Day with Joy Was Bright First Line: That Easter day with joy was bright Tune Title: PUER NOBIS NASCITUR Author: John Mason Neale Meter: LM Scripture: Matthew 28:9; Luke 24:34; John 20 Date: 2013 Subject: Christian Year | Easter Vigil; Christian Year | Resurrection/Easter; Jesus Christ | Resurrection; Christian Year | Easter Source: Latin hymn, 5th cent. 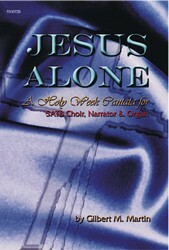 Display Title: That Easter day with joy was bright First Line: That Easter day with joy was bright Tune Title: PUER NOBIS NASCITUR Author: John M. Neale Date: 1992 Source: Aurora lucis rutilat--Part III, Claro Paschali gaudio; Hymnal Noted, 1851, alt. Display Title: That Easter Day with Joy Was Bright First Line: That Easter day with joy was bright Tune Title: ERSCHIENEN IST DER HERRLICH TAG Author: John M. Neale, 1818-66 Meter: LM with allelulia Date: 1982 Subject: Easter | Source: Latin hymn, 4th or 5th cent. Display Title: That Easter Day with Joy Was Bright First Line: That Easter day with joy was bright Tune Title: PUER NOBIS Author: John M. Neale, 1818-1866 Meter: LM Date: 2001 Subject: Easter | Source: Latin, 5th C.
Display Title: That Easter Day with Joy Was Bright First Line: That Easter day with joy was bright Tune Title: PUER NOBIS NASCITUR Meter: L.M. Scripture: Luke 24:29; John 20:19-23 Date: 1990 Subject: Christ | Conqueror Source: Early medieval Latin hymn; Tr. 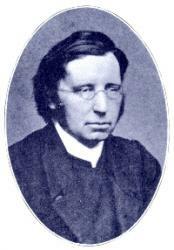 in Hymns Ancient and Modern, 1861; alt. 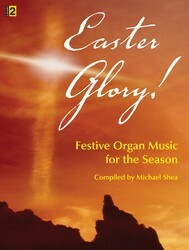 Display Title: That Easter Day with Joy Was Bright First Line: That Easter day with joy was bright Tune Title: PUER NOBIS NASCITUR Meter: L.M. Scripture: John 20:1-29 Date: 2018 Subject: Christ | As Conqueror; Christ | Resurrection of; Joy | Source: Early medieval latin hymn; Tr. : Hymns Ancient and Modern, 1861, alt. Display Title: That Easter Day with Joy Was Bright First Line: That Easter day with joy was bright Tune Title: PUER NOBIS Author: John M. Neale, 1818-1866 Meter: LM Scripture: John 20 Date: 1986 Subject: Easter | ; Easter Vigil | ; Easter Season | ; Children's Hymns | ; Jesus Christ | ; Petition | ; Praise | ; Victory over Sin and Death | ; Canons | Source: Latin, 5th C.
Display Title: That Easter Day with Joy Was Bright First Line: That Easter day with joy was bright Tune Title: PUER NOBIS Author: John M. Neale, 1818-1866 Meter: LM Date: 2011 Subject: Easter | Source: Latin, 5th C.
Display Title: That Easter Day with Joy Was Bright First Line: That Easter day with joy was bright Tune Title: PUER NOBIS Author: John M. Neale, 1818-1866 Meter: L.M. Scripture: John 20:24-29 Date: 2008 Source: Latin hymn, 5th c.